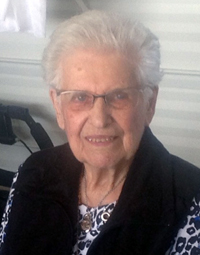 Peacefully at the Notre Dame Foyer on Monday, January 28, 2019, Mrs. Alice Mabon of Notre Dame de Lourdes, Manitoba passed away at the age of 95 years. She leaves to cherish her memory her six children: Lillian Mabon, Gérald (Claudia), Robert (Geraldine), Evelyne Mabon, Jeannine (Murray) Skayman and René (Bonnie) Mabon; her grandchildren: Annick (Trevor), Joline (Tony), Joel (Bryanne), Eric (Amy), Lisa (Tyler), Daniele (J.P.), Nathalie (Jason), Nicole (Aaron), Stephanie (Brandin), Darcy (Jenna), Michel, David (Lauren) and Nicholas; her great-grandchildren: Cameron, Lachlan, Finn, Henry, Piper, Norah, Olivier, Lexie, Samantha, Danielle, Kristina, Logan, Mattie, Reggie, Colden and Nyla. She also leaves to mourn her sister Laurette McGreevy, and sisters-in-law Colombe Chabbert, Julie Mabon and Jeanne Mabon; as well as numerous nieces, nephews, relatives and friends. Alice was predeceased by her husband Jean, her siblings Antoine (Maximilenne) Chabbert, Emile (Clemence) Chabbert, Blanche (Henri) Gevaert and LouLou Chabbert; brothers-in-law Bill McGreevy, Marcel (Juliette), Georges, Pierre and André Mabon. Funeral Service will be held in the Notre Dame Roman Catholic Church on Saturday, February 2, 2019. Rosary and Video Tribute at 1:30 p.m. followed by Mass 2 p.m. with Father Alain Guneou officiating. Family Interment to follow in the Parish Cemetery. In lieu of flowers, memorial donations may be made to the Notre Dame Health Foundation-Notre Dame Hospital, Box 190, Notre Dame de Lourdes, MB R0G 1M0 or to the Notre Dame Foyer, Box 190, Notre Dame de Lourdes, MB R0G 1M0.